Create the mood for your home with Solar Sunshades. Find your perfect fit today at our Cardiff or Bridgend Showroom with our superb selection of blinds, awnings, shutters, curtains & home automation systems. Made to measure curtains and blinds. Simply Blinds is one of the best kept secrets in Bristol when it comes to Blinds for your home or office. Our many loyal customers keep referring their friends and colleagues to us because they not only trust our advice but respect our expert installation and we are as the name says – “Simply Blinds” and we offer a full range of fabrics, and a wide range of materials from which to choose including suedes and linens allowing you the ability to match existing furniture and decor. We will come to your home or office and measure your windows for the perfect fitting window coverings and our price includes free expert fitting. Yes you might find cheaper prices with some of our competitors but we will not sell you a cheaper product because our reputation is all about providing the best for our customers at a reasonable price so give us a call 0117 370 6142 for a free consultation. Simply Blinds Bristol is committed to customer satisfaction, unlike some of our competitors that only sell online, we make House and Office calls so you are not wasting your time ordering a product only to find that it’s not quite right. We bring everything to you so you can choose the right product first time – that’s customer service and satisfaction! Simply Blinds Bristol offers the following types of Window Blinds: Vertical Blinds – are practical, versatile, and stylish, while providing excellent light control for your interior decor. Venetian Blinds – a large selection of wood and and an even larger selection of aluminium venetian blinds with widths to suit you. Roller Blinds – Available in a multitude of designs to blend with your surroundings. 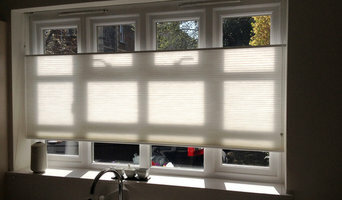 Roman Blinds – In lots of different fabrics to suit your environment, with an option to have blackout or otherwise. Simply Blinds made to measure window blinds are simply the best says Mr. T Hughes of Bristol, the representative that came to our home presented us with a very special offer that included all fitting and we are thoroughly delighted with our new windows. Contact Simply Blinds for a Free Quote. Victoria & Scarlet. Blinds, Curtains & Interiors. 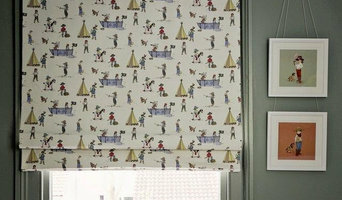 Curtain makers, retailers and designers in Cardiff can work wonders with pieces of fabric, while fitting blinds or shutters can be tricky to do yourself, so it’s definitely a wise idea to hire a window dressing professional in Cardiff who can design, make and/or fit bespoke blinds, curtains or shutters for you. 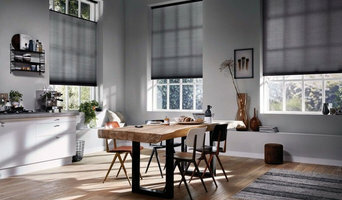 Whether you want sleek roller blinds for your home office, roman blinds for your kitchen, venetian blinds to smarten up your living room, plantation shutters for your bay windows or delicate voile curtains for the bedroom, there will be Cardiff curtain makers, blind fitters or shutter company to help you with your ideas on Houzz. A curtains, blinds or shutters company in Cardiff will first be able to advise you on the style of window dressing that will work with your windows and rooms. If you have an idea or design in mind for your window dressing, then discuss this with any potential experts, such as curtain makers in Cardiff, to see if your design and style is possible. You will need to work closely with them if you are planning on having custom curtains, bespoke blinds or shutters created. Curtain makers will be able to turn most fabrics into curtains, so if you’ve found a pattern or fabric you like already, present this to your Cardiff curtain makers and they could be able to turn it into curtains for you. Even when clients don’t have certain fabrics in mind, curtain makers can suggest fabrics based on your style and the rest of the room’s design. They can pick out the right weight, thickness, length and pattern that would suit your room. Curtain retailers in Cardiff will offer a huge range of readymade curtains, or curtains that can be adjusted or made to order. Contact Cardiff curtain retailers if you’d prefer to choose from a large selection of ready-to-go curtains; whether they are high-end designer curtains or just plain white curtains; rather than waiting for some bespoke designs from a curtain maker that may take a bit longer. You may find that curtain makers in Cardiff also offer a stock of ready-to-go curtains, too, but always double check with the professional first. Once you’ve decided on a design, curtain makers, blind fitters and shutter professionals will usually measure your windows or doors to ensure a good fit. If you are having blinds or shutters made then it will probably be best to have them professionally installed, too. Blind fitters and shutter companies should offer this service with their products as blinds and shutters need to be firmly fixed to the windows; something that most homeowners don't know how to do themselves. Although roller blinds and Roman blinds can be fairly simple, vertical blinds and Venetian blinds can be a bit more complex, and if you want remote controlled blinds that operate with the touch of the button, then you definitely need to call in the Cardiff blind fitters. Plantation shutters are substantial window dressings and need careful measurements and installation, so it’s really best to leave the measuring, design, manufacture and installation to a professional Cardiff shutter company. Blind fitters, shutter companies and curtain makers in Cardiff should also check the insulation of your chosen window dressing and make sure there are no potential hazards once fitted. Finally, they should confirm with you that your curtains, blinds or shutters are functioning as you’d like them to before finishing the job. What should I ask Cardiff curtain makers, blind fitters and shutter professionals? Find curtain makers, blind fitters and shutter professionals on Houzz. 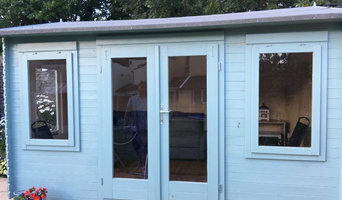 Narrow your search in the Professionals section of the website to Cardiff blind, shutter or curtain maker professionals. You can also look through photos to find examples of Cardiff window dressings that you like, then contact the curtain retailers, blind fitters, shutter professionals or curtain makers in Cardiff who worked on them.